Back to Basics - Kids Having Fun Playing Hockey - Many coaches, managers, parents, and kids expressed to the tournament organizers that they had a fantastic time in the tournament. Generally, people expressed that by removing most of the stoppage of play, going to four- on-four, and removing the body contact DRAMATICALLY increased the speed of the game. With lots of scoring chances and plenty of opportunity for high drama finishes. Of course the highlight was the penalty shots at the end. More than enough opportunities to become an on-ice Stollery legend. Tournament Organizer, Patrick Dumelie, said: “We were convinced that the four-on-four would lead to a fast paced, entertaining game, after all, that’s the way we use to play it on the ODR (for parents – out-door rink). The games were exciting and fun with the right balance of sportsmanship and competition.” We want to thank all the referees and coaches for adapting to our format, using it as an opportunity for the kids to continue to develop and of course, for making it fun for the players. 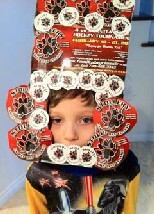 Get out your noise makers, the 2012 tournament is sure to be even better! Teaching our Children the Value of Caring for Those Less Fortunate – The Stollery Tournament was founded based on Tournament Founder, Steve Serdachny’s desire to teach children the power of philanthropy. Steve and a few of his close friends were reflecting one day on how fortunate they were to have healthy children and how important it is that our children learn the importance of giving back to community and those less fortunate. 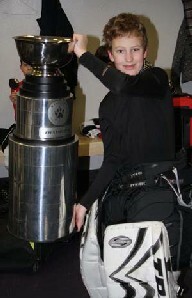 Soon after, Steve’s vision of: “Playing for Healthy Kids – Giving Back to Others”, the Stollery Family Day Tournament was born. “I was reflecting on my own children but also the many hockey players involved in my hockey schools. Hockey is a phenomenal sport to teach life skills, this tournament is just another opportunity for our children to learn and grow while supporting kids who, because of illness, may not have the same opportunity.”….. Steve Serdachny, Power Skating, Hockey, and Edmonton Oiler Skills and Skating Coach. Being healthy and supporting others to regain health. Philanthropy and giving back to individuals and community. Active living and fitness through hockey. Fair play, sportsmanship, fun, and reasonable competition. Empowering Community to Get Involved - to organize and pull off a 70 team hockey tournament with over 1,000 minor hockey players takes a tremendous amount of volunteer effort. Literally hundreds of hours are donated by tournament organizers and their families, time keepers, raffle draw organizers and tournament officials. Over 50 volunteers donated their time and efforts to achieve the tournament goals. Thank-you to all the volunteers who demonstrated Philanthropy in action and made the 2011 Tournament such a fantastic success. It is derived from an ancient Greek meaning “to love people”. Philanthropy is an act of donating money, goods, services, time and or effort to support a socially beneficial cause with a defined objective and with no financial or material reword to the donor. If you are interested in volunteering for the 2012 tournament please contact us at sdcooking67@hotmail.com. Getting the Business Community Involved in Supporting the Stollery and Hockey Development. The tournament also relies on many corporate sponsors who generously donate funds to support our goals. “We are so fortunate to have such great community leaders in Edmonton. These sponsors exemplify what it means to be a leader within our community. If you have an opportunity thank them for their generous donations to support hockey development and the Stollery Kids”……Mike Web Stollery tournament organizer. La-Z-boy Furniture Galleries, Dolce Vita Homes, ECS Enhanced Communication Solutions Inc., Maclachlen & Mitchell Homes Inc., Realty Executives, Swarm Enterterprizes, Rolling Mix Concrete, Serdachny Powerskating and Hockey, Creologic, Boston Pizza, Beck Commercial, Denshel Associates, MSI Metalworking Solutions Inc. Welcome to Ron Dickson and Associates and Murray’s Trucking as new sponsors for 2012. The Tournament Raised Funds that Exceeded Everyone’s Expectations - “This was our first year and we didn’t know what to expect. The committee had a goal and a belief that no matter how much money was raised we would be making a positive impact on the kids and our community. We were blown away to see how the donors and the kids responded”…..Mohammad Moussa 2011 Tournament Organizing Committee . 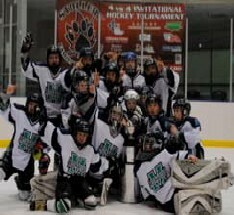 The 2011 Stollery Family Day Hockey Tournament raised over $189,000. Edmonton Minor Hockey Association received a gift of $35,000 with the funds being directed toward minor hockey development. The remaining $144,000 went directly to the Stollery Children’s Hospital to support their efforts in ensuring that kids from our community get world class care using the latest advancements in technology. Get Involved – You can make a difference and teach your teach your team or child by example. You can sign up to be a volunteer, donate a silent auction prize, become a corporate sponsor, or provide some leadership or support to your team to fundraise. To donate or Volunteer, please contact the tournament organizing committee at (steve@elitepowerskating.com). Support Your Team and Your Hockey Player to Learn to Give Back to Their Community. Youth have a positive desire to make a difference in our community. They know what other kids need, have energy, ideas, and passion. They don’t need us to “do it for them” but rather they need our support to put their imagination to work. “I have been approached by some parents who say: “more fundraising? We just completed our team fundraising initiatives.” I respond this is different. This should not be about the parents raising funds for their kids. It is about the kids taking the initiative to raise funds for kids who are less fortunate than themselves. Teach them to fundraise, don’t do it for them”…… Patrick Dumelie, Tournament Organizing Committee. By teaching them at an early age that they can make a difference we can support them in building self esteem, confidence, team skills and organization skills. Most importantly it will we can help them grow a life-long commitment to making our community a better place for everyone. If they raise $25 or $2,500 it will be a success that cannot be measured today, as it will support our community for a generation. In order to achieve the goal of promoting hockey and healthy children we are asking each team to empower and enable the players to give back and support others less fortunate. Each player will receive a pledge sheet and is encouraged to go out and get pledges from friends, family and neighbours. These pledges will go directly to the Stollery Children’s hospital to help kids who require the world class health services provided by the Stollery. We are aiming for this to be a player driven initiative that engages our youth to get actively involved in thinking of others and giving back to those less fortunate. We are challenging each Player to raise a minimum of $100. All the proceeds will go to supporting the Stollery and minor hockey in Edmonton. In addition to the money that will be raised, we believe there will be a tremendous benefit to the players by creating a understanding of the benefits of giving back, raising awareness and caring about others in the community. It is also a time for all to reflect how fortunate they are to be healthy and able to play the best game in the world. Managers must immediately email out to all players and coaches the tournament Fundraising Package. All players & coaches will receive a pledge sheet and a copy of this newsletter. All tracking sheets and pledges will be turned into Stollery representatives prior to the teams first game of the tournament on February 18th, 2012. Team managers or coaches will collect and submit the individual packages together. All pledges must be collected prior to the event. Will there be Team and Individual Rewards again this year? A $1500 scholarship to the Serdachny Program of Excellence Spring and Summer training program 2012. A Sidney Crosby autographed Jersey. Ryan Nugent Hopkins autographed Jersey. The top fundraising teams from each level Novice to Bantam will receive team pizza and pop party for all their team and coaches at Boston Pizza. We are encouraging everybody to participate in the spirit of giving back to the Stollery and Hockey Edmonton including our coaches. You will play a big part in encouraging the players to do their best and get actively involved in the process on an ongoing basis. Have a team meeting so everyone understands. Make it a challenge. Have some fun. Tournament schedules and rules will be available approximately two weeks prior to the tournament. We are looking forward to an amazing event that will positively impact our youth and community at large in a big way. Your support is greatly appreciated.